Under-inflation can lead to host of problems, causing everything from wheel slippage to reduced tire life. 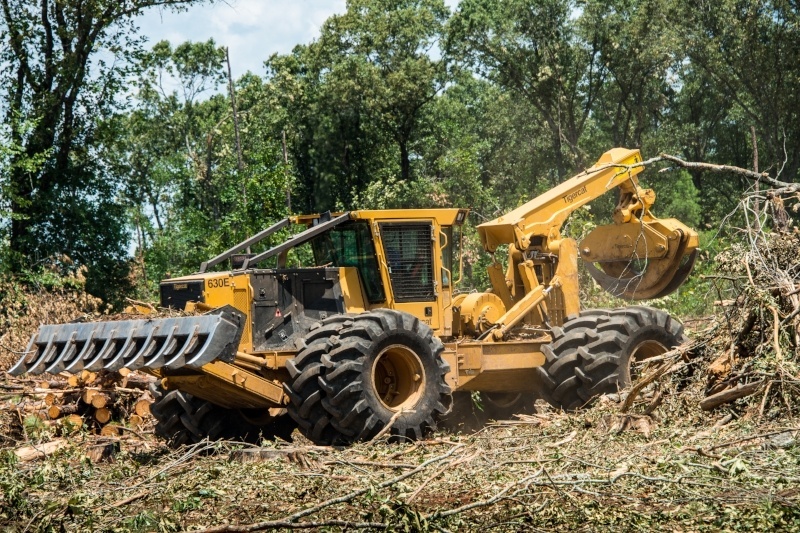 Wheel slippage can result in a gamut of problems for loggers. At its most benign, wheel slipping can tear up the forest floor, increase fuel costs, and hurt a machine’s productivity. At its worst, wheel slippage can cause flats—it jerks the valves from the tubes—causing downtime, grinding logging operations to a halt, and, in the long run, hurting profits. Additionally, under-inflation allows a tire’s sidewalls to bulge more than intended, which can cause stress cracks in the sidewall. Under-inflation also can result in cracking at the base of the lugs, as the weight of the machine pushes the lugs into the face of the tread—an issue exacerbated by the growing size and power of today’s equipment. Stress cracks—the result of under-inflation—can even appear around the tire’s bead. Another negative consequence of under-inflated tires is an over-stressed engine. A good indicator of this is if you see an increase in the amount of black smoke coming out of your machine’s exhaust pipe. Not only is this tough for the machine, but it also burns more fuel. Steep slopes, sharp stumps, and puncture-threatening debris all present hazards to forestry tires. And, just like under-inflation, over-inflating the tires on logging equipment can have negative consequences. Over-inflated tires are susceptible to impact damage from stumps and rocks, because they will not flex as much as a properly inflated tire. Over-inflated tires also bulge in the middle of the tread, creating uneven wear and shortening the life of the tire. Making matters worse, a tire that’s bulging in the middle isn’t putting its full tread on the ground, which leads to a loss of traction. Looking for another reason to avoid over-inflated tires? Simply, over-inflated tires deliver a far less comfortable ride for the operator. The lesson here is that even as we continue to build tires with tougher treads, stronger steel belts, and cutting-edge compounds, operators need to ensure their equipment’s tire pressure is set correctly to maximize the advantages offered by our high-tech tires. A properly inflated tire will keep a machine from wiggling around in uneven terrain, help eliminate sidewall deflection, and help end wheel slippage. It will also help to ensure your tires last as long as possible. By checking tire pressure once a week—it takes roughly fifteen minutes—you can ensure your machine’s tires are properly inflated and save a huge amount of time and money in the future. A properly inflated tire will improve your machine’s fuel economy, boost machine efficiency, reduce downtime, and extend a tire’s lifespan. It will also deliver a more comfortable ride—keeping operators happier and more productive. So frequently check your tires’ inflation pressure—and, if you have any questions about what pressure you should be running your tires at, ask your local dealer or the tire’s manufacturer. Another awesome idea is to weld a nut on top of the cap that covers the valve stem, that is if there isn’t one there already. This allows the cap to be removed using a ratchet or a pull handle, rather than needing a large pipe wrench. Of course, don’t forget to replace the valve cover after you’ve checked the tire’s air pressure. To learn more about ATG’s Primex Brand of forestry tires—and learn how they are engineered to handle not just today’s logging equipment, but the logging equipment of the future—contact your dealer or Alliance rep today!